The American Society of Naturalists (ASN) conferred its prestigious 2018 Presidential Award to evolutionary biologists from the National Centre for Biological Sciences of the Tata Institute of Fundamental Research, based in Bangalore, India. The ASN Presidential Award honors an outstanding research article from among all the papers published in the society’s journal, The American Naturalist, in the preceding calendar year. This is a prominent scientific journal that publishes research papers in frontier areas of evolutionary biology. This year’s award was given to the NCBS team for their research paper in the April 2017 issue of The American Naturalist, probing how evolutionary processes shape the formation of ecological communities in diverse tropical ecosystems. The genesis of the study began in December 2010, in Boston. Thinking about how ecological pressures and co-evolutionary dynamics may shape the formation of animal communities, Dr. Kunte turned to his favourite organisms: tropical butterflies. Some butterfly species are unpalatable to their predators, usually owing to the toxins they accumulate as caterpillars from the plants on which they feed. Hundreds of palatable butterfly species that are not related to these toxic species have come to closely resemble them over evolutionary times. This type of mimicry fools predators, who avoid these perfectly palatable butterflies by confusing them with toxic species with which they have prior unpleasant experience. Thus, there is a clear parasitic relationship between the toxic models and their palatable mimics. Together, these butterfly species form clearly defined ecological communities called ‘mimicry rings’. 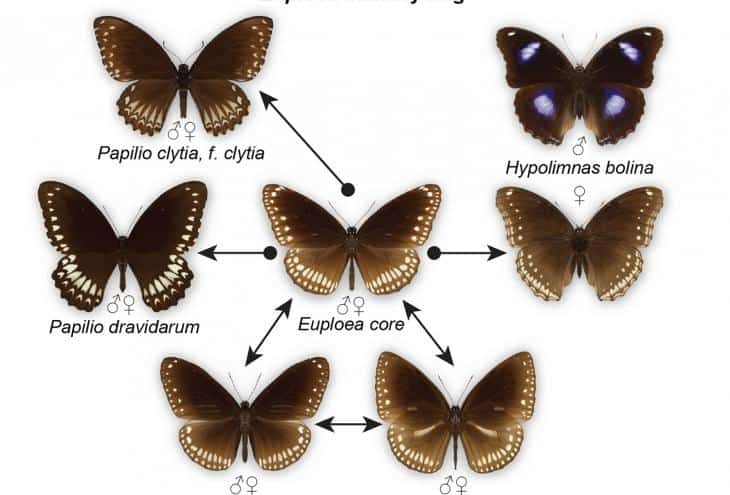 Dr. Kunte decided to look closely at how convergent evolution and biogeographic processes shape the formation, diversity, and composition of these butterfly mimicry rings. Upon joining NCBS in 2012 as a faculty member, Dr. Kunte’s team began sampling mimetic butterfly communities of the Western Ghats of India, which had never been studied and characterised properly. The NCBS research team turned out to be a perfect blend combining Dr. Kunte’s intimate knowledge of evolutionary theory and tropical butterflies with Dr. Joshi’s skills at advanced phylogenetic methods, and supplemented by Ms. Prakash’s analysis of mimicry rings diversity. The team built a molecular phylogeny (species tree) of the Western Ghats mimicry rings with the intent of studying the level of convergent evolution in these butterfly communities. By then, new phylogenetic methods had been developed to probe community assembly in an evolutionary framework, which Dr. Joshi applied to this problem in novel ways. Contrary to the widespread belief that mimicry rings are formed from convergent evolution between highly dissimilar butterflies, the NCBS team discovered that toxic models in the Western Ghats mimicry rings are indeed closely related, sharing their ancestral, warning-wing colour patterns even when new species are formed. Thus, the toxic models do not show convergence, but have similar wing patterns because of a shared ancestor. The mimics, however, join the mimicry rings after remarkable bouts of convergent evolution, sometimes separated by tens of millions of years. Interestingly, the peculiar geography of the Western Ghats appears to have influenced species diversity in these butterfly mimicry rings. Evergreen forests of SE Asian tropics and the eastern Himalayas–part of the Asian mainland–support very diverse mimicry rings. On the other hand, mimicry rings in the Western Ghats–a young, isolated mountain chain that acts as a habitat island–are species-poor. Ecological theory has long posited that small or far flung islands have species-poor communities when compared to mainlands (and large islands nearby), owing to limits on dispersal. Mimicry rings in the habitat island that is the Western Ghats beautifully demonstrate this pattern. Most biological diversity on earth is concentrated in the tropics. If we want to truly understand and conserve this diversity, biological sciences need to flourish in tropical and developing countries. “The historical, ecological and evolutionary processes that give rise to the precise composition of biological communities is still largely a mystery. The best people to solve this problem are scientists who are sympatric with the rich biodiversity of the tropics, but they are seldom up to the task. This study is a notable exception and should help motivate more tropical biologists to take pride in contributing to solving such major biological puzzles, especially when they happen to be located in their backyard,” said Prof. Raghavendra Gadagkar of the Indian Institute of Science, a well-known evolutionary biologist who has made fundamental contributions with his research on tropical wasps and ants. Dr. Kunte’s lab is planning to expand this work to mimicry rings not only in the Asian tropics but also elsewhere. “There is great value in comparative research on the grander global scale on which natural selection–that singular evolutionary force–has performed breathtaking experiments in bio-diversification over many million years”, says Dr. Kunte. The ASN is the oldest scientific society dedicated to the study of evolution, ecology, and animal behavior, having been formed in 1883. The society journal, The American Naturalist, had been started in 1867, and is thus the oldest journal devoted to evolutionary biology. Previous recipients of the ASN Presidential Award include prominent scientists as Richard E. Lenski (1985, 1991), Nancy A. Moran (1988), Dolph Schluter (1996), Robert E. Ricklefs (1998), and Robert D. Holt (2012).